Open & light interiors, spacious rooms, banks of windows and crisp colors all bring to mind mid-century homes. These homes, especially those built in the early 1960’s, have a unique vibe that is very special for buyers. Built a bit bigger, they often have a two-car garage, extra storage, a couple of baths and big yards. A mid-century modern home may be just the answer for you as you think about where to live for the next 10 years. 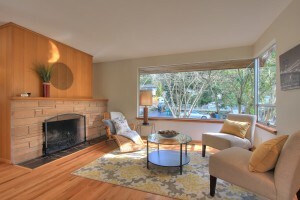 I’ve just sold a 1961 home that had just two owners since it was built over in NE Seattle in the Meadowbrook community. Having a sandstone fireplace, an open flow from the Living Room to the Dining area and out to the deck makes it very easy to enjoy and brings in wonderful afternoon sunlight. The original tile countertops and oak floors were cleaned up & refinished but not replaced because they suited the home. If you’re trying to find a home with more of a horizontal feel, I’d recommend searching for a mid-century in one of your favorite neighborhoods.